Deeney pens in added time? The first time we showed we could be more than Div 3 South fodder. The day we slid on our bellies & escaped the swamp. The play-off penalty shoot-out win at Birmingham on the way to the Bolton match deserves an honourable mention. 1-0 down after 1 minute of the 2nd leg in the menacing cauldron of a packed St.Andrews but we hung on for 119 more minutes and 14 penalties until Chamberlain saved the last to see us through. I remember the noise of the Birmingham fans was as intimidating as it was loud. Yes, Bolton at Wembley was better, as was Leicester and yesterday, but this one is up there for me. Hornet4ever, Markoa$, Rozerhorn and 1 other person like this. That's no. 15, too low given how you described it. And under Ken Furphy, the second greatest manager in WFC's history. No way should it be below the Leeds league cup game, who may have been defending champions but didn't win a league away game all season, or the 1982 Everton win (it's not that uncommon for newly promoted sides to win their first game, and Everton weren't that great then) instead of the 8-0 against Sunderland, a game that truly showed Watford meant business (that's #19). Possibly my favourite ever away game. Could have been Palace 2006 or Brighton 2015 both of which I had to watch on TV or even my first evening away game 4.3 vs Peterborough 1994? which effectively kept us up. I find it difficult to separate the above. They all have personal reasons as to why they are special and I think where you sat and who you go with has a massive impact. The Leicester game is a bit tainted after us failing to win promotion but that Deeeeney moment was more dramatic than the game just gone. I was also near the front of the Rookery so caught up in the drama whereas at Wembley (and the Millenium stadium) I was up with the God's. Saying that I started going in the early 90s, and back then the idea of being in an FA cup final was reserved for computer game fantasies. To do it in the way we did was special. Part of the fun of putting the book together was trying to assign an order to something that is impossible to sort. There is no right answer but context is everything. The Leeds cup win, for example, was a great, great night in a decade-long morass. It came at a time when absolutely nothing good seemed to happen – and no one knew that night that Leeds would not win an away game that season. The victory over Everton was the first top flight game. It's not just about whether the opposition were a great side or not, or whether it was an amazing performance and so on, it has a historical context that cannot ever be repeated. Watford can never again win their first ever top flight game, it is an absolute. Emotion, history, subjectivity has to come into it. Anyway, the book, and the list, are there to spark memories, debate and disagreement. Ballsed up replying, so reposting. Mods, feel free to sort out as we can't delete or amend posts anymore, I don't think! Just reading the 4-0 thrashing of the ratbags up the road one and saw this: "Kennedy recalls the manager saying jokingly: ‘Don’t score again because it’s going to go bonkers.’ But Mooney’s memory is of Taylor telling his men to go out and score another four." I don't recall ever hearing that from Mooney before, only the Kennedy bit. What's the source of this? I'm pretty sure GT said after the game we deliberately took our foot off the pedal. Could be wrong though. They also played really well and were unlucky not to get an equaliser on the day. RookeryDad and Happy bunny like this. ...and David "I'm too good for you now" Holdsworth getting sent off ! The reason the Plymouth game is so high on the list is similar to the explanation given for the Everton game being there: it was a huge first for the club. 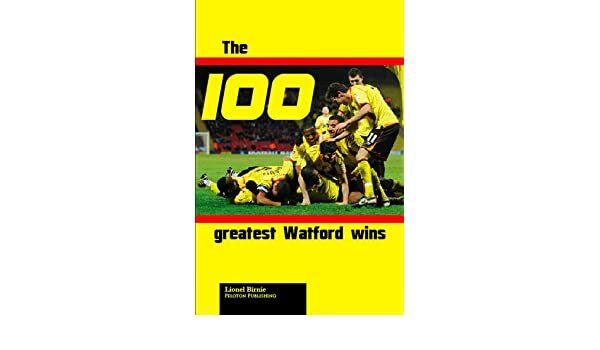 The Cup Final was so big in those days that the idea of Watford being in it was unthinkable. Remember the 'holy grail' for decades was reaching the Second Division. I don't think anything the club could do now would create an equal to the amazement we felt that day. Thanks for replying. When was this book published? It goes up to the end of the 2010/11 season, so I imagine it was ready for Christmas 2011. The victory over Everton was the first top flight game. It's not just about whether the opposition were a great side or not, or whether it was an amazing performance and so on, it has a historical context that cannot ever be repeated. Watford can never again win their first ever top flight game, it is an absolute. What about our first ever Champions League game? Only live on TV for pay-per-view @ £30 a game! Good luck to them, they can **** off and never come back when the financials collapse. No transfers except from between themselves either, and no signing up thousands of kids for £10m each when they are only 5 yrs old either. If we go back 40 years, based on the smile on my face on match day +2, I'll add Hull City 4-0 to win promotion, and the Southampton 7-1. I celebrated the other games mentioned but those two were the closest to how I'm feeling today. That period would include Doyley Day - and it's at #36! Were you there when Doyley scored? Tbf, the Bristol City win was the important one, the Fulham was just the party. The source for that is an interview with Mooney conducted specifically for that book. It was published in October 2011, so the season before the Pozzo takeover. If you’re talking about 1998, we didn’t beat Bristol City. Crikey,; now that's what I call research. And, of course, we were far from favourites. It was more than a little hairy that day - I'm pretty sure the ref bottled a penalty as it was already 4-0. Yes and yes - two fantastic days, just a long time ago.